As this Momentum e-news prepares to blast, many families and agencies are preparing for the buckets of rain and wind courtesy of Florence. We at Formed Families Forward encourage all to prepare for the storm and its potential for changes to family, school and work routines. Here are a few good resources, specific to preparing children with disabilities and special needs for natural disasters and the disruption they may bring. Buckets of ... Fall Activities! This fall, we have planned many training, support and family events, perfect for helping families and professionals start the school year off right! This coming Sunday evening, join us for a free Back to School: Surviving Reentry webinar at 6:30 PM. Learn some sure-fire approaches for supporting your child/ren this new school and gain practical strategies for sharing sensitive information with the school. We invite you to share your "go to" hints as well. REGISTER HERE. On September 24, we are excited to host our first Loudoun Connect evening for foster, adoptive and kinship families, at the ALLY Center on The Arc of Loudoun's Paxton Campus in Leesburg. Formed Families Forward will present on Ensuring Success for Students with ADHD. We invite famiiles from Loudoun, Prince William, Clarke, Warren, Fauquier counties and beyond to join us for a great training, followed by a discussion of what foster, adoptive and kinship family supports are most needed! REGISTER HERE. Future Loudoun Connect events include a free WISE Up: Handling Tough Questions about Adoption on November 26, for both parents and children. Presented by the Center for Adoption Support and Education. REGISTER HERE. refreshed website design. The new site features photos of real formed families and is easier to navigate. We added a great new search function too! Mark your calendars now- A full list of our FFF-sponsored and hosted fall events is available HERE. Teens and Youth Adults: Programs for YOU! Middle school students- Only a few slots left for our fall course of LifeSkills Training, Tuesday evenings in Herndon. Starting this coming Tuesday, September 18, this free 6 session course helps middle school youth gain healthy, preventive responses and critical social skills. A light dinner is served each week and teen participants can earn gift cards for regular participation. REGISTRATION required . Deadline Monday, September 17 for LEAP grants for youth and young adults ages 14-26. The Arc of Loudoun adminsters the Life Enrichment Awards Program which provides goods and services that facilitate youth transition planning and for which resources are usually not available from public service and government agencies. The program is open to individuals with disabilities across northern Virginia; maximum grant amount cannot exceed $1000. Learn more HERE. Teens and young adults who have lived experiences with mental health challenges are encouraged to attend the free advanced youth leadership trainings offered by YouthMOVE Virginia. The next one is October 6-7 in Roanoke and funds are available for travel. Learn more HERE. In the meantime, drop-in teen peer support groups are available at the Fairfax Falls Church Community Services Board's Merrifield Center on Thursday evenings. FLYER HERE. Q: I heard that Virginia is changing the requirements for getting a regular diploma. My children with IEPs have a hard time passing SOL tests and have been able to get locally awarded verified credits in a different way. Are they still going to be able to get those credits and graduate? A: You are correct, there have been some recent changes made by the Virginia Department of Education (VDOE). The number and types of credits required for a student to earn an Advanced Studies Diploma and those required for a Standard Diploma are now different for students entering ninth grade for the first time in 2018-19 and forward. In both cases, the number of standard credits required remains the same but the number of verified credits has been reduced to 5 total for each type of diploma. Students earn verified credits by successfully completing required courses and passing associated end-of-course SOL tests or other assessments approved by the state. Credit accommodations provide alternatives for students with disabilities in earning the standard and verified credits required to graduate with a Standard Diploma. Credit accommodations provide alternatives for students with disabilities in earning the standard and verified credits required to graduate with a Standard Diploma. One type of accommodation is a modification in way a student earns locally awarded verified credit. It is really important for families understand the options for a student to earn verified credits. This Credit Accommodations At A Glance document from VDOE provides a good overview and is helpful to bring to IEP and other meetings. The process for earning an Applied Studies Diploma available to students with an IEP, remains. It is also important for families to be aware that VDOE has approved a number of "substitute tests" and pass scores which can be used to award verified credits. The full list of substitute tests and scores is HERE. All these changes and the specifics of earning required credits can be very confusing. Parents and caregivers are encouraged to review the linked information available from VDOE and then schedule time with your child's special education team. Important decisions about credits and course selection are made as early as late elementary school, so it is critical for families to understand what decisions may mean for their student's graduation options. The Region Returns to School! We refreshed the FFF website this summer and made it easier to find our and others' trainings on our website calendar. Just click on the EVENTS tab! September 16- Back to School: Surviving Re-Entry 2018 webinar presented by Formed Families Forward. September 18- October 23- LifeSkills Training for middle school students, provided by Formed Families Forward, Herndon. September 24- Foster, Adoptive and Kinship Loudoun Connect: Ensuring Success for Students with ADHD, hosted by FFF, Leesburg. September 27- Screening of film Angst: Raising Awareness around Anxiety, hosted by Loudoun County Public Schools, Ashburn. September 29- Fairfax County Public Schools Mental Health and Wellness conference, Fairfax. FFF will be there! 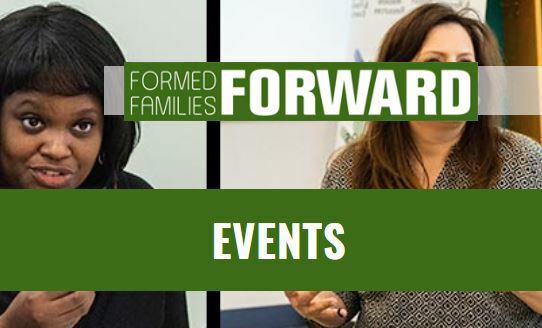 October 1 - Behaviors and Beyond: Understanding and Parenting Children with Autism Spectrum Disorders, hosted by Formed Families Forward, Fairfax. October 13- Loudoun County Public Schools Mental Health Symposium, Ashburn. FFF will be there! Formed Families Forward bids a fond farewell to Rhonda Jackson, who has headed to new adventures in another state! Rhonda served on the FFF Board of Directors for many years, including a term as Treasurer. We appreciate your service to families, Rhonda! The FFF Board is a great opportunity for parents, caregivers and professionals to give of time and talent to support foster, adoptive and kinship families raising children and youth with special needs. Learn more about FFF Board opportunities HERE.